Hello and welcome to My-O's 32 Birthday Blog Hop! 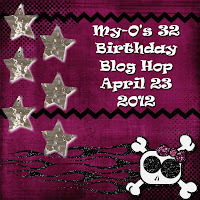 Shannon is turning 32 and what better thing to do then have a hop with us crafty people to celebrate!! If you stumbled upon this hop by chance, excellent!! Just make sure you start back at the beginning to give Shannon, the birthday girl, some warm wishes and for a chance to win some awesome yummy candy!! If you came here from Ashley's Blog then you are on the right track! For my project I made a birthday card for the Birthday Girl! I have been playing with my "Imagine" of late and I just love "Lori's Garden". I chose one of the images printed and cut it at 2.5 inches. All the mats were also printed from "Lori's Garden" Green is Shannon's favorite color so I used a green color for the top mat and embossed it with a Tim Holtzs embossing folder, I layers that on a script mat and put it on a 4.25 x 5.5 charcoal card base. added a yellow ribbon with a bow some Bling to each corner and a Birthday Sentiment from one of "My Creative Time" stamp set. Sorry the picture isn't very good I am having some camera issues of late! Such a beautiful card! Love the image and your embossing! How pretty is this? Great job. adorable card! Love the embossing and all the cute little birdies! The image is Beautiful!Lovely Card! Great card. Love the image. Thanks for sharing. Hey there I am a new follower... What a pretty card! Lori's Garden is my favorite... The paper is so perfect!Thanks for sharing! Wow! I have an imagine but I don't have Lori's garden. This is so beautiful! I bought the Imagine "Best Friends" Cart at Michael's the other day on sale for $34.00, I hope that means that the prices on the carts are coming down. Your card is beautiful, I love it! Great job!! Thanks for being part of my special day!! Janet, beautiful card. Everything fits and looks great together. Very pretty card. Love the embossing. Nice being in the hop with you. Such a sweet little card...I love it! ohh very pretty~ love the soft colors! Very sweet card! Love the embossing in the background!! This card is too cute! I love the layering and the image is aweseome! !